"So are you guys here for a guides exam?" my partners and I look at each other, feeling somewhat accused of something. "Why do you ask that?" we said. He replied, well the Colorado Mountain School jackets for one, and you all have those red boots on. Apparently the locals seem to recognize the red Tango S Evo GTX as a indicator that you are a visiting climber. This makes total sense, this boot is overwhelmingly the boot of choice for guides and recreationalists as well. I have been using this boot for several seasons now and it is hands down the most comfortable mountain boot I have ever had on my feet. For a CMS guide, a normal week in the summer might consist of several Longs peak routes, a couple days at Lumpy ridge and maybe an alpine spire or two. All of this adds up to a ton of trail miles and always with a heavy pack. This means you need to do two things, lighten your pack when you can, and take care of your feet. This boot does both of those things beautifully. The boot itself is very light (under 27 oz) so instantly you do not have the ankle-weight affect of the old heavy leather boots from days gone by. 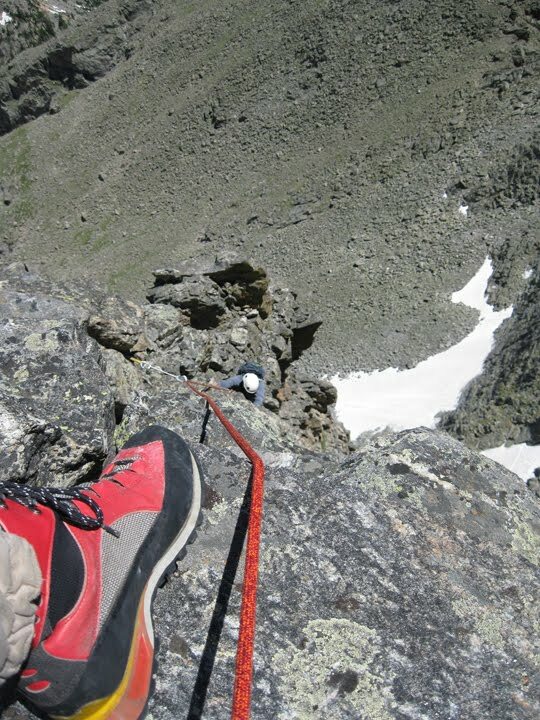 Not only is it light on your feet but it climbs so well that for most alpine rock routes up to about 5.8 I find that I can take my rock shoes out of my pack and feel 100% solid climbing in these boots (must be the sticky Supertech rubber). Now, when you throw in the ability to accept a semi-automatic crampon this becomes the ideal tool for all of the classic mountaineering routes I can think of. Kieners on Longs peak, Sharkstooth, Fisher Chimneys on Shuksan, Rainier, or any fourteener in the lower 48, the Trango S-Evo would be just the ticket. 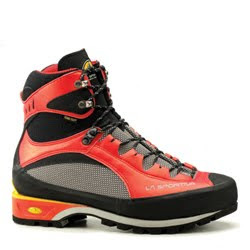 These boots are durable, comfortable and very nimble, they climb better than some rock shoes I have owned and keep my feet dry and happy, I really cannot think of anything more I could want. This boot is without a doubt the best footwear purchase I have ever made.